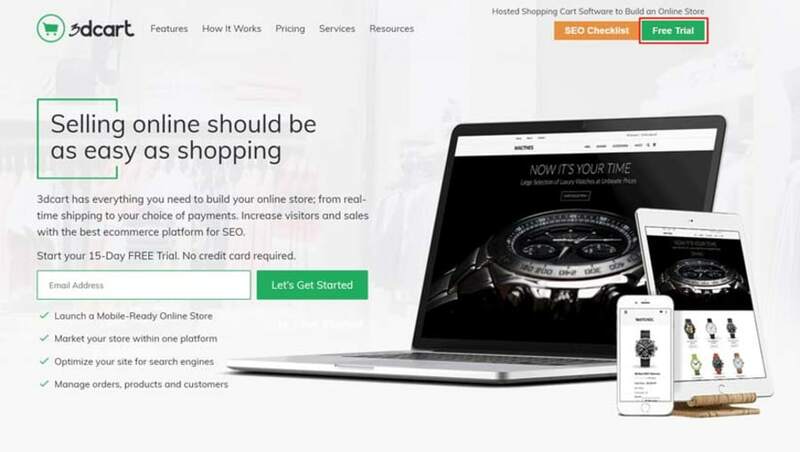 15-day Free Trial of 3Dcart ecommerce website builder. Looking for 3Dcart promo codes and coupons? #MasterTheWeb and save money today with our exclusive The Webmaster offers. Get a 15-day completely free trial of 3Dcart website builder, then just $29.99 per month. You can save 10% on all plans when signing up for yearly billing when using this coupon code. For $50 3dcart's SEO experts will perform a site audit to find any SEO-related issues with your website. 10% off all SSL certificates at 3Dcart. Once you have clicked the 3Dcart coupon code above, you will be taken to their website. Once there, click the “Free Trial” button that appears in the top right hand corner. Click your chosen 3Dcart discount © The Webmaster. Enter Name, Address, and Telephone Number. Signing up with 3Dcart shopping cart software is easy. Just enter your name, address, and telephone number and you will get access to all their advanced features. No credit card or other billing information is required. Enter Name, Address, and Telephone Number. © The Webmaster. Not really. I suggest you look closely at the features each plan offers and decide from there. Ultimately, it may be cost effective to start with the Basic plan, and then upgrade as you develop your website over time utilizing features only available in the more expensive plans. Are there any setup or sales transaction fees? Unlike many other online store builders, 3Dcart do not charge any transaction fees. You will, of course, be charged a small fee by your fee processor. Yes. You can cancel at any time from within your control panel. Is it easy to upgrade to another plan? Yes, upgrading is easy. Just contact 3Dcart via one of the support methods, and they will upgrade your account. No. You can choose to pay monthly, or yearly. You can pay via Visa, MasterCard, Discover, American Express or PayPal. The signup process seems only to accept cards, but PayPal is advertised as a payment method in the sidebar. If you wish to pay via PayPal, I suggest contacting them directly. All invoices are charged in Dollars. Not only do you have the option to try out 3Dcart completely free with our special offer, but there is also a 30-day money back guarantee. You can use our 10% off promo code when selecting a yearly billing period. Alternatively, you can use an existing domain you have registered elsewhere. I highly recommend Namecheap or GoDaddy, as the renewal fees are lower. I have created a detailed tutorial showing how to sign up with them and point your domain to your hosting provider. Yes. 3dcart is certified Level 1 PCI DSS compliant. Does 3Dcart include email accounts? Email accounts are provided on their Plus plan (10 email accounts), and Pro plan (20 email accounts). There are unlimited email accounts on their Enterprise plan. Will I need to buy an SSL Certificate? No. 3Dcart includes a free shared SSL certificate. However, you can purchase dedicated SSL certificates from them from $99 per year (which does seem a little overpriced).